How to change the location of the tab bar? in Opera 12.18 (which I used until yesterday) I could specify where the tab bar was (top, left, right, bottom). How can I do the same in version 49? There was a whole menu for such customisation, this seems to be gone. For that, you will need Vivaldi and maybe UltraSurf. yes i want my tabs on the bottom and a real status bar under that. here's my vavaldi. 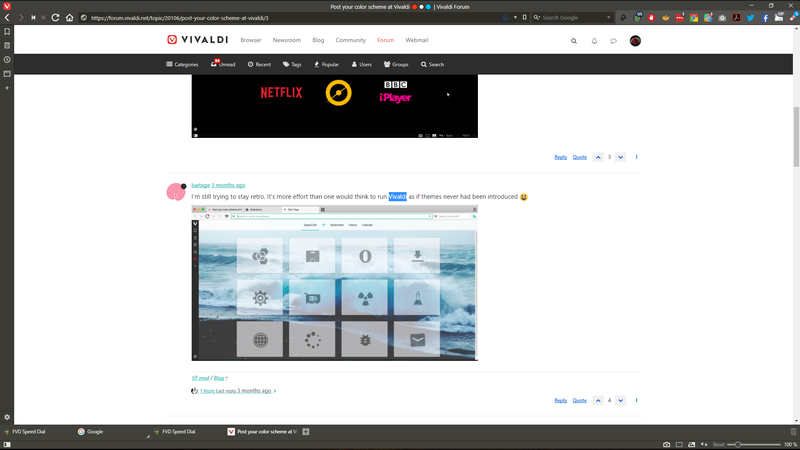 I don't like tabs this way, using a mouse isn't useful because you have be very accurate to click on tabs, default tabs place are easly since you are limited with the top of the screen, the only way for me would be moving the OS taskbar on top and the tabs to the down edge.